If you don't want to see posts from your friends or if you want to see posts of selective friends then this tool can help you. If you receive too many friend requests and if you have reached your friend request limit then this tool can help you to reject all friend requests. Facebook ID extractor allows you to extract IDs of your profiles, groups, events and Facebook pages for free. All you need to do is enter the URL and click on the extract ID button. This tool adds all friends as group members and helps you to increase the number of group members to make your. This tool is made to make your group more active. Sometime we receive too many friend requests and clicking on confirm button can become a painful job. This tool automates the process of accepting all friend requests , in a three simple clicks you can accept thousands of friend requests. Inviting all friends to your Facebook event can become a painful job if you have more than 1000 thousand Facebook friends. Event invitation tool is made to automate the process of inviting all friends to your Facebook event. This tool allows you to send multiple friend requests to your Facebook friends. In a single click you can send many friend requests. This tool allows you to suggest your Facebook friends to add another Facebook friend. If your friend recently joined Facebook and you want to let other friends know about him then this tool can be useful. This tool generates a download link for public Facebook videos. All you need to do is enter the URL of the Facebook video and click on generate download link button. After that user can visit the download link and press CTRL + S to save the video on their hard drive. These are premium automation tools with advanced functionality and these tools are reserved on for premium users. To purchase a premium license please use the links given in the extension box. Premium extraction tools are advanced automation tool made to retrieve information about your Facebook friends, Facebook Groups and Facebook Pages. These tools are reserved only for premium members, make sure you have purchased a premium license key to use these tools. Facebook allows you to post on all Facebook groups using their group email, this tool will allow you to generate a list of group emails to use for sending emails. Some Facebook friends don't share their email address publicly. We can use Facebook email to contact them using their email address. Emails sent to their Facebook email will be transferred into their primary email inbox. This tool allows you to get email address of Facebook friends to send emails to their Facebook email. Extracted emails can be used as a target audience in Facebook ad campaign. This tool allows you to collect public phone numbers of your Friends. These phone numbers can be used to add your Facebook friends on whats app or it can be used as a target audience in Facebook ad campaign. 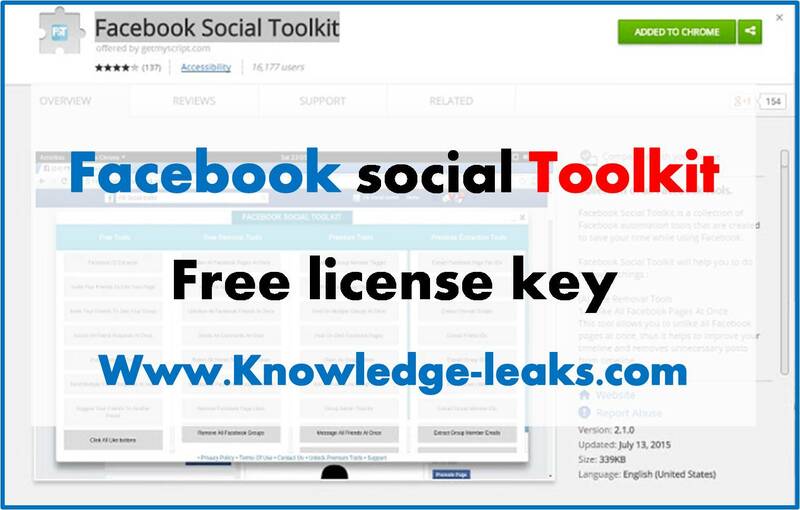 Admins's Note : We Are Not Designer Of Facebook Social Toolkit Extension . Dear #AAYUSH NAGPAL Check Pm ' We Have Sent You License Detail . Dear #AAYUSH NAGPAL Thanks For Your Feedback. Dear Mohamed elbadry Contact At Our Facebook Page. Dear Follow The Rules And Contact At Our Facebook Page . Dear #FILMES PITZE Check Pm ' We Have Sent You License Detail . Thanks For Your Feedback , And Keep Visiting Our Site. Thanks For Your Feedback #Ramzi Mebarek . 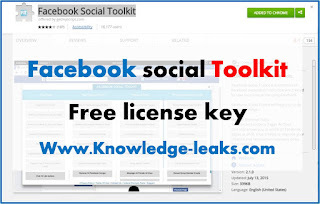 Dear #FUNNY Cool Check Pm , We Have Sent You Facebook Social Tool Kit Detail . Thanks for the license key, I am very thankful. Hola que gran post podria ser tan amable de pasarme la licencia por favor mi correo es lararoberto100@gmail.com Gracias que buen aporte me servira de mucha ayuda. Como hago para obtener LICENSE KEY free? me serviría de mucha ayuda por favor es para progresar mucho mas gracias a las herramientas y actualmente no poseo nada de dinero para pagar la premiun. se lo agradecería de corazón. si quiere podemos conversar vía skype para que me conozca mejor. saludos y éxitos les deseo lo mejor es sus proyecto a todos las personas que se lo proponen con determinación y perseverancia. Ya le envie un mensaje porque usted no me puede dar acceso? a mi y a otras personas si? necesito la ayuda. It's do work, thanks a bunch! We Have Sent You License Detail . Please send me licence key. Thanks!!! very interesting for me, could you give me licence code ? Can you please give me the license key? Working great! Thank you very much! Thanks for the license. It is really working great! Thank you very much for the licence!!! I pm you for license key but still i am waiting for it. I message you on Facebook. Kindly give me license key for this. Hey, guys, what's your Facebook? The site's button doesn't work. Hello admin, please send the license key.